Suppose you have a variable called SALES that you want to forecast. 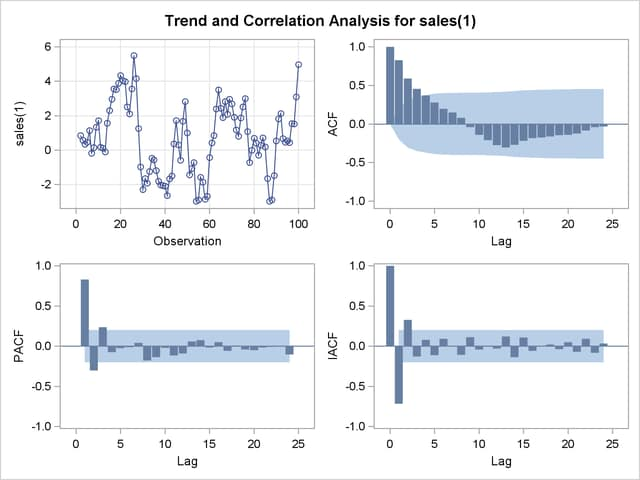 The following example illustrates ARIMA modeling and forecasting by using a simulated data set TEST that contains a time series SALES generated by an ARIMA(1,1,1) model. The output produced by this example is explained in the following sections. The simulated SALES series is shown in Figure 7.1. The IDENTIFY statement first prints descriptive statistics for the SALES series. This part of the IDENTIFY statement output is shown in Figure 7.2. This correlation analysis panel is shown in Figure 7.3. These autocorrelation function plots show the degree of correlation with past values of the series as a function of the number of periods in the past (that is, the lag) at which the correlation is computed. The NLAG= option controls the number of lags for which the autocorrelations are shown. By default, the autocorrelation functions are plotted to lag 24. Most books on time series analysis explain how to interpret the autocorrelation and the partial autocorrelation plots. See the section The Inverse Autocorrelation Function for a discussion of the inverse autocorrelation plots. The last part of the default IDENTIFY statement output is the check for white noise. This is an approximate statistical test of the hypothesis that none of the autocorrelations of the series up to a given lag are significantly different from 0. If this is true for all lags, then there is no information in the series to model, and no ARIMA model is needed for the series. The autocorrelations are checked in groups of six, and the number of lags checked depends on the NLAG= option. The check for white noise output is shown in Figure 7.4. In this case, the white noise hypothesis is rejected very strongly, which is expected since the series is nonstationary. The p-value for the test of the first six autocorrelations is printed as <0.0001, which means the p-value is less than 0.0001. The second IDENTIFY statement produces the same information as the first, but for the change in SALES from one period to the next rather than for the total SALES in each period. The summary statistics output from this IDENTIFY statement is shown in Figure 7.5. Note that the period of differencing is given as 1, and one observation was lost through the differencing operation. The autocorrelation plots for the differenced series are shown in Figure 7.6. 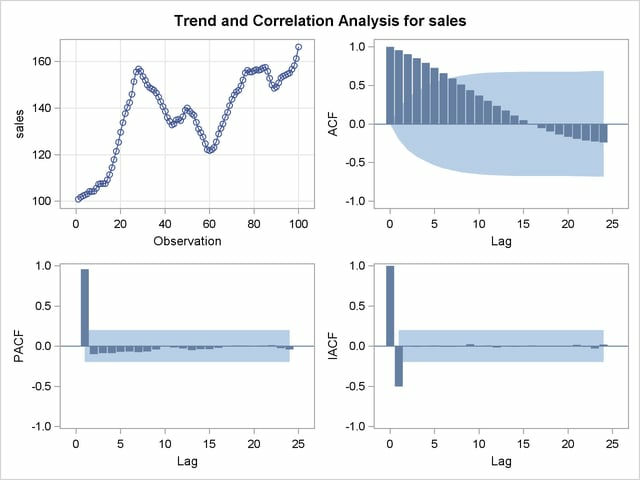 The autocorrelations decrease rapidly in this plot, indicating that the change in SALES is a stationary time series. The next step in the Box-Jenkins methodology is to examine the patterns in the autocorrelation plot to choose candidate ARMA models to the series. The partial and inverse autocorrelation function plots are also useful aids in identifying appropriate ARMA models for the series. In the usual Box-Jenkins approach to ARIMA modeling, the sample autocorrelation function, inverse autocorrelation function, and partial autocorrelation function are compared with the theoretical correlation functions expected from different kinds of ARMA models. This matching of theoretical autocorrelation functions of different ARMA models to the sample autocorrelation functions computed from the response series is the heart of the identification stage of Box-Jenkins modeling. 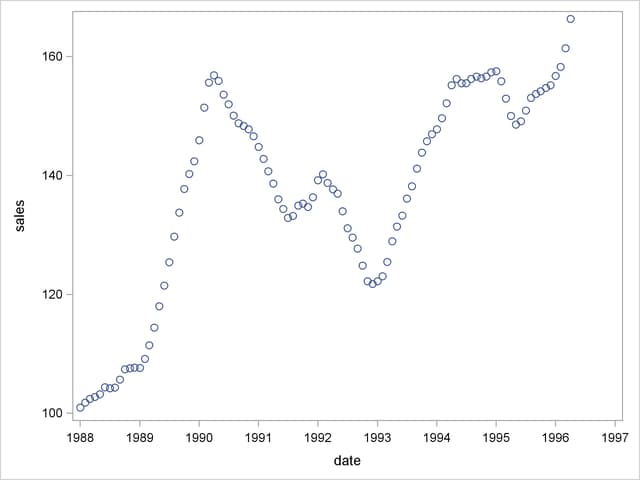 Most textbooks on time series analysis, such as Pankratz (1983), discuss the theoretical autocorrelation functions for different kinds of ARMA models. Since the input data are only a limited sample of the series, the sample autocorrelation functions computed from the input series only approximate the true autocorrelation function of the process that generates the series. This means that the sample autocorrelation functions do not exactly match the theoretical autocorrelation functions for any ARMA model and can have a pattern similar to that of several different ARMA models. If the series is white noise (a purely random process), then there is no need to fit a model. The check for white noise, shown in Figure 7.7, indicates that the change in SALES is highly autocorrelated. Thus, an autocorrelation model, for example an AR(1) model, might be a good candidate model to fit to this process.